Seeing as it's now the end of March I thought I'd share my March favourites with you! I've had these earrings for a few months now, they came in a pack of earrings and I liked the others so really didn't plan on wearing these because I wasn't really a fan of silver jewellery. However, for Valentine's Day and mine and my boyfriend's anniversary, my boyfriend bought me two silver necklaces - and now I love silver! Just shows that you have to find the right piece of jewellery to fall in love with the metal! So I've been wearing these earrings a lot throughout March! I got this perfume from my mum last Christmas, and have been wearing it ever since! My mum could always smell it on me so she ended up loving it and bought herself a bottle lol. It's such a girly scent - if you love sweet smelling perfumes then this is definitely for you! I used to be obsessed with this lipstick a few years ago, when Topshop first released this colour as a limited edition colour. When they stopped selling it I was so upset, but now Topshop have it as a permanent colour - yay! I completely forgot how much I loved it until I wore it for the first time in agesssss and fell in love with it again! I'm upset that it's nearly run out though - need to buy it again! The Sleek lip liner is a perfect match for this lipstick! My nan is so creative and clever, she makes these little bunny rabbits! My nan is amazing at knitting! When my sister and I were younger she'd make us little knitted cardigans, and knit us toys. My nan tried to teach me to knit - I'm not bad lol but would love to be able to do the amazing things my nan can do! This little bunny lives on my dressing table in my bedroom, and as it's Spring now I thought it'd be the perfect time to show her off lol. 6. 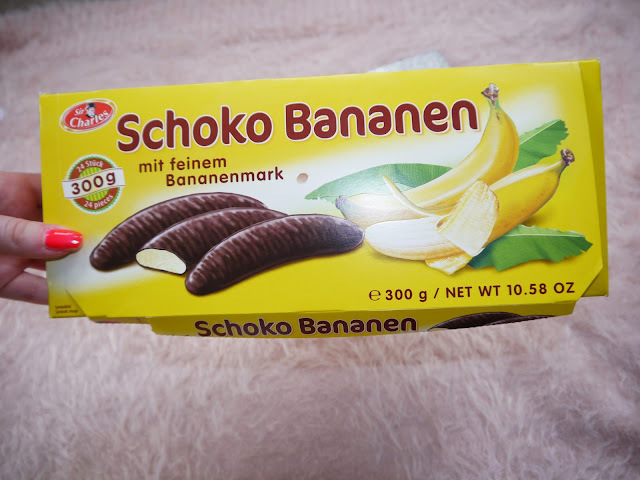 Weird German banana chocolate things! I got these in ESK, they were £1.39 for a box and you get 24 chocolate banana things in there. I love them so much and I'm upset that they're all gone! I need to go back to ESK to buy some more! It's a soft banana sweet covered in chocolate. My boyfriend doesn't like them because he thinks they're too sweet, but idc - more for me!! So they were my March favourites! Let me know if you've tried/own any of the things I've mentioned above :) If not, let me know what your March favourites are - I'd love to know! I've been meaning to try Ariana's perfume for ages! It looks soooo pretty I just haven't smelt it yet! 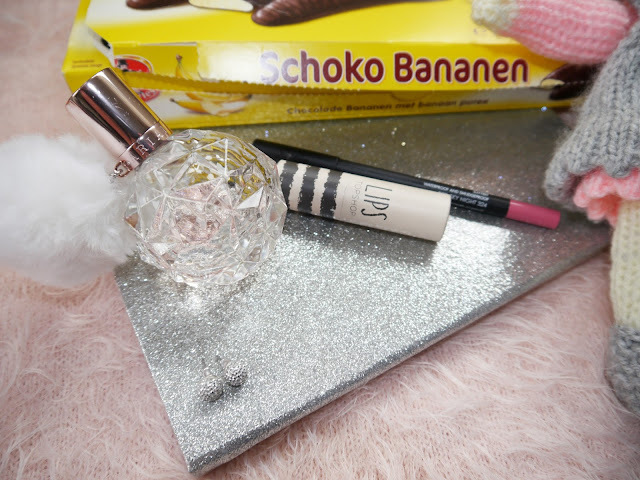 The lipstick by Topshop looks perfectly feminine for Spring and the 'weird german banana chocolate things' (fab description by the way! haha) sound delicious - combining two of the tastiest ingredients, mmm! I'm a massive fan of Topshop lipstick too! I didn't think I would be as I generally don't trust fashion stores to bring out half decent makeup ranges but with Topshop I was SO pleasantly surprised. 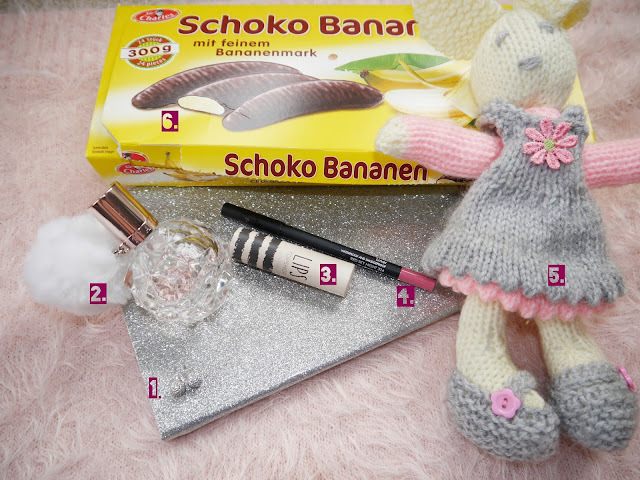 Those chocolate banana things look lush, too - although I ate so much chocolate over Easter I think I'm done for a year now haha! Thanks too for your lovely comment on my blog :) Do you want to follow each other on Bloglovin' so we can keep up with each others' posts? 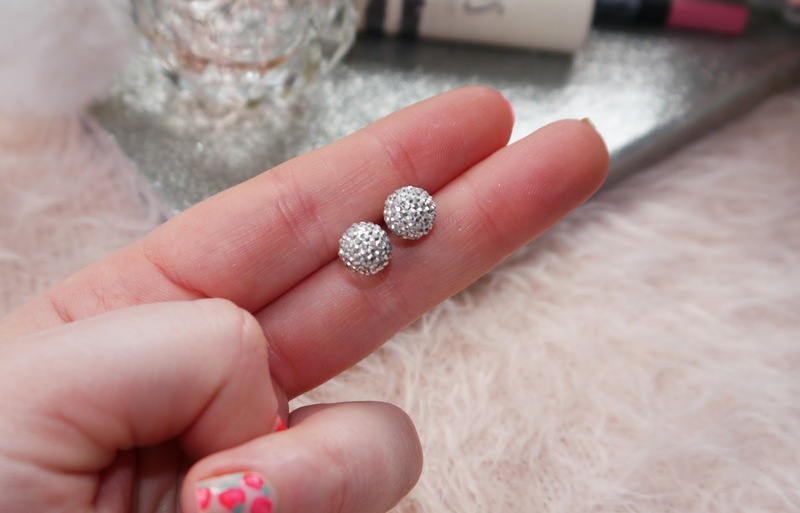 I have some earrings pretty much identical to yours and they're my fave for everyday. I love how they sparkle! Definitely have the Zayn Malik song in my head now after reading about Pillow Talk haha! It's a really pretty shade though, ultra feminine and perfect for spring! I've always been intrigued by Topshop's lipstick, they have a brown matte one I want to get! I have a similar pair of earrings too.. Lipstick color is one of my favorite.. I've never tried the makeup from Topshop but I love the packaging of that lipstick, I'll have to look for it the next time I stop by! Also, those banana things look sooo good. I usually don't have a sweet tooth but I can see myself going through a box of those real easy haha. I love that your favourite post is not only beauty products but a mixture of everything. Love that earring and I have read lots of great reviews on TopShop makeup but never tried any myself. Also the lipstick color seems nice and natural, so lovely! I love everything here! That perfume is something that I want to try, it sounds amazing! I have some earrings exactly like yours and I have a pink pair as well! I should really give Topshop make up ago, don't know why I've never looked into it more! Love your collection here, so cool! The earrings are so pretty and that lipstick shade is so cute! I gotta try those chocolate bananas! they look amazing! Pillow Talk looks like such a gorgeous shade! 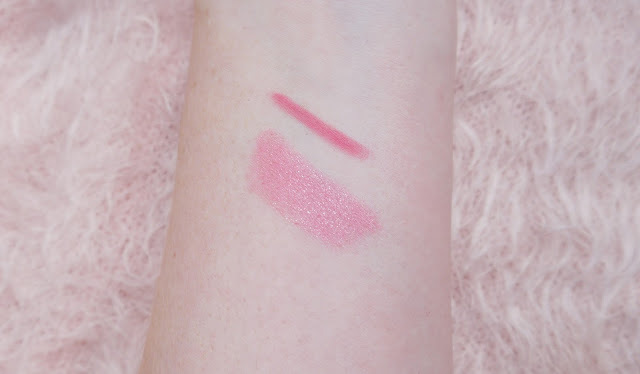 I only have one Topshop beauty product, their lipstick in the shade Innocent - and I love it, so definitely want to try more! That knitted bunny is too cute! I think you blog is really nice by the way, let me know if you would like to follow each other! These earrings are really cute! You are so lucky to have Nan that knits, and that you know how! I've always wanted to learn myself. Thanks for sharing your faves, I haven't tried any of these myself. Also thanks for stopping by my blog and leaving a comment. I'll be following you from now on. Hope you follow my blog as well. Have a great weekend!